Does your back hurt when you stand? Here’s what you can do to relieve the pain. It’s important to know why it hurts for you to stand. This way, you can correct your problem once and for all. 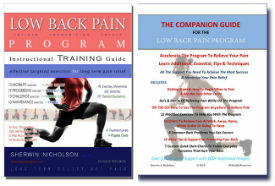 Even though there are many reasons for your back to hurt, the most common cause however, is mechanical. The truth is that most of us suffer from it. Does this matter to you? It sure does. With mechanical issues, you have and unbalanced support system among your muscles, joints, and discs. Poor balance means injury and pain. But you can control it. If your pain is from mechanical issues, then it happens after MANY physical problems have been ignored. Too many mechanical problems lead to this. In fact, pain is a clear signal to you that these mechanical problems need to be fixed. 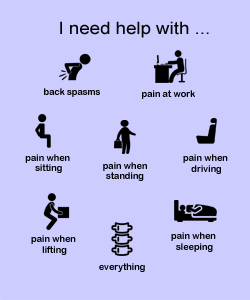 The job, career, activities and even the way you sit, directly affect your ability to stand pain free. They each alter your mechanics. Once you can correct what is the source, standing will become easier for you. This is why it hurts. Fortunately, the problems can be resolved by uncovering each factor individually to have lasting relief. What can I do about my discomfort right now? You can follow these simple moves right now to help relieve your pain. They are pretty straight forward and don’t take much time. You’ll definitely notice a difference in how you feel! The Deep Squat Rest exercise and The Standing Abdominal exercise (outlined below) are 2 of the best ways to begin to combat your pain. A sure sign that you need these exercises is that as you keep standing, the soreness and discomfort gets worse and you want to sit or lie down. That’s partly because your muscles are fatiguing and you’re feeling the effects the longer you stand. Caution: If you find them too difficult to do, that’s because your imbalances are pretty severe. The more you do them, the more relief you’ll have. If you need more help then get this Guide so you can teach yourself how to stand with much less discomfort. If it hurts only when you stand, then the solution should be simple right? Sorry. Simple fixes to only one or some of your imbalances and injuries without addressing them all will only result in minor relief that will not go away. Although it may seem easy to fix (because the symptoms are local and temporary), many of us assume that the solution is also simple. We subsequently look for easy solutions only to feel disappointed or to believe that our particular solution is not possible. This is simply not the case. Back pain is complex, with many factors and the process to overcome it should be viewed as a step-by-step and multifaceted one. To be able to address it, first, begin with what is required to keep your lumbar spine healthy and what causes it to suffer chronic pain. The lumbar spine consists of your lumbar vertebrae, vertebral discs, interconnecting facet joints, a complex nervous supply that travels in between each vertebra, soft tissue, ligaments, tendons, and muscles. In a healthy spine, the muscles that support it (extrinsic and intrinsic) are actively contracting and relaxing as you stand. These contractions are always working to maintain your balance. When these muscles are functioning properly, the distribution of weight and force on your discs and facet joints are balanced and even. The shape of each vertebra along with these active contractions create the natural S-curve of your spine. This is the ideal curve you should maintain during all times of activity. This curve protects the spine from uneven pressure exerted on the discs that can lead to disc bulge. Uncontrolled disc bulge leads to a risk of rupture and herniation of the disc. Uneven contraction and relaxation of the muscles leave discs and facet joints at risk for injury. It is important to maintain these muscles with proper conditioning to avoid discomfort. The muscles themselves, specifically the intrinsic muscles also become fatigued and injured. Standing pain that is mechanical usually begins with a failure to maintain these healthy muscles groups. Over time, they become weaker, tighter, shorter and unable to perform as before. Sitting is a big cause of why it hurts you so much. Extended periods of sitting is usually a lifestyle choice that should be carefully monitored and adjusted to reduce your chances of recurring pain. Key areas of imbalance, are the: lower back muscles (usually too tight, too strong and overused), abdominals (too weak, extended and underused), hip muscles (too tight, weak and underused) and the hamstrings (too tight, shortened and underused). If you can imagine that the muscles from behind you are tightening while those in front are extending, then you can visualize the lumbar discs and facet joints being pinched, causing a bulge out in front. 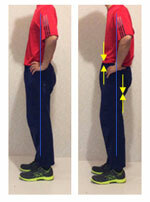 You can develop an anterior pelvic tilt which is worsened by excess weight. When this occurs over an extended period, the facet joints become worn and inflamed leading the facet joint inflammation, wear, and discomfort. Chronic imbalance also leads to advanced disc degeneration, especially to the L5-S1 disc. The L5-S1 is the most important yet abused disc, crucial for your lumbar flexibility and protection. It is vital to correct any muscle imbalances in these muscles groups to bring much-needed protection and relief to the lumbar spine. Even when, there already is significant injury such as disc wear and facet joint inflammation, it can still be reduced dramatically, long term when you recondition and exercise these areas properly and effectively. These groups each require specific exercises and stretches unique to what you need. Learn more about the exercises involved for relief. Follow this exercise to help you. If you are ready for a comprehensive system that teaches you exactly what movements and corrections to use, scroll below. You will be trained to perform many exercises, but the effort will be well worth it. Achieving relief is not a quick fix, and this program does not rely on such methods. 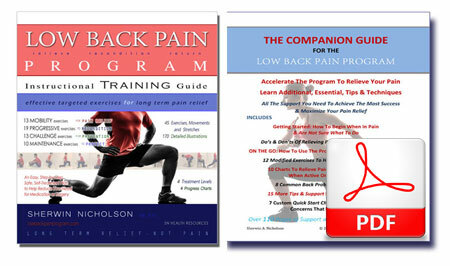 Get the Guides & take care your back today.